In some people, cholesterol levels in blood become very high. This is called high cholesterol. LDL (“bad” cholesterol) is considered a major risk factor for heart disease and stroke. 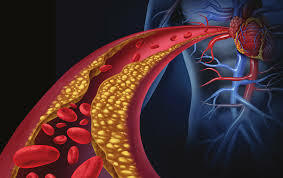 LDL cholesterol is thought to irritate the lining of blood vessels, causing hardening of the arteries. Who Needs to Lower Cholesterol? Vitamin B3 (Niacin) - Vitamin B3, also called niacin, is used to lower cholesterol. Specifically it appears to lower LDL cholesterol and increase HDL cholesterol. Well-designed studies have found that niacin lowers LDL cholesterol by 10% to 20%, lowers triglycerides by 20% to 50%, and raises “good” HDL cholesterol by 15% to 35%. Niacin appears to significantly lower levels for arteriosclerosis too. Artichoke Leaf - There is some research suggesting that artichoke leaf extract (Cynara scolymnus) may help to lower cholesterol. Artichoke leaf extract may work by limiting the synthesis of cholesterol in the body. Artichokes also contain a compound called cynarin, used to increase bile production in the liver and speed the flow of bile from the gallbladder, both of which may increase cholesterol excretion. Legumes like peas and beans. Some fruits like apples, prunes, and berries. Some vegetables like carrots, brussel sprouts, broccoli, yams. Plant Sterols and Stanols - Plant stanols and sterols (such as beta-sitosterol and sitostanol) are naturally occurring substances found in certain plants. Stanols are added to margarine,orange juice, and dressings. Research found that plant stanols and sterols might help to lower cholesterol. They are similar in structure to cholesterol and may help block the absorption of cholesterol absorption from the intestines. Studies have found that stanols significantly reduced total cholesterol and LDL cholesterol, but had no significant effect on HDL cholesterol or triglycerides. Stanols and sterols appear to enhance the effects of other methods to lower cholesterol. In studies, people taking the statin drugs to lower cholesterol had an additional improvement in their cholesterol levels with stanols/sterols.